Reprinted from The Barbecue! Bible. Photo copyright © Ben Fink. In the U.S., 175 days on the calendar have been designated as food holidays by presidential proclamation or trade/industry groups. Somehow we missed National Acorn Squash Day (September 7) and National Date-Nut Bread Day (September 8). But National Cheeseburger Day? Now that’s a holiday we can really get behind. It would be almost un-American not to eat a cheeseburger on Friday, September 18. Lionel Sternberger, a 16-year-old fry cook, working at his father’s Pasadena, California, restaurant (The Rite Spot) in 1926. Legend has it a homeless man, wanting more bang for the buck, asked Sternberger to crown his burger with a slice of cheese. In 1928, a Los Angeles eatery called O’Dell’s listed a chili cheeseburger on its menu. A trademark for the name “cheeseburger” was awarded to Louis Ballast of the Humpty Dumpty Drive-In in Denver, Colorado. Regardless of its origin, there’s no denying the cheeseburger’s allure. 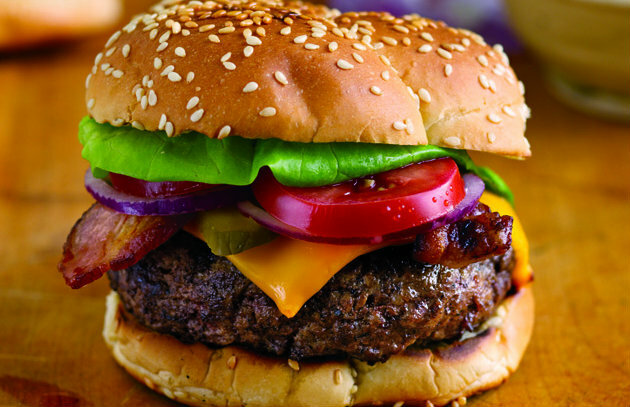 (Seventy-five percent of us eat at least one a week, reports the trade magazine Burger Business.) The biggest cheeseburger ever assembled—a Guinness world record holder at this writing—weighed 2,014 pounds. It was built by the Black Bear Casino in 2012 in Carlton, Minnesota, and contained 60 pounds of bacon, 50 pounds of sliced onions, 50 pounds of lettuce, and 40 pounds each of pickles and cheese. The patty itself was 10 feet in diameter and had to be flipped with a crane. 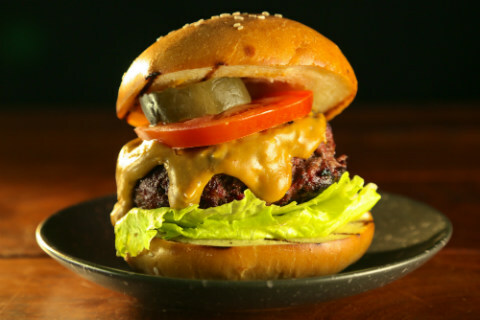 South Minneapolis is the birthplace of the “Juicy Lucy” (also spelled “Jucy Lucy,” depending on which bar you visit), a cheese-filled patty that’s also topped with cheese. 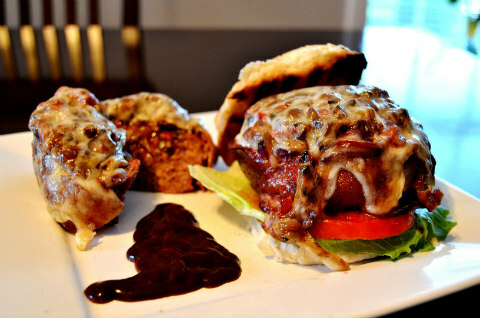 Steven calls his version the “Inside-Out Cheeseburger.” Find the recipe here. In the “Tackle the Tailgate” episode of Project Smoke™, we smoked burgers with hay, grilled them, and topped them with a generous dollop of Rauchbier Cheese Sauce. (Rauchbier is smoked beer.) Get the recipe. For a new take on cheeseburgers, try Beer-Can Burgers—deep cavity; mucho cheese. Mix coarsely grated cheese (about 1 cup per pound of meat) into the meat before shaping the patties. The cheese will keep the burgers moist as they cook. Finally, don’t be a slave to orange processed cheese. Try real aged cheddar, blue cheese, feta, goat cheese, smoked Gouda, pepper Jack, muenster, Manchego, or any other melting cheese. Share your creations on the Barbecue Board. Happy National Cheeseburger Day!